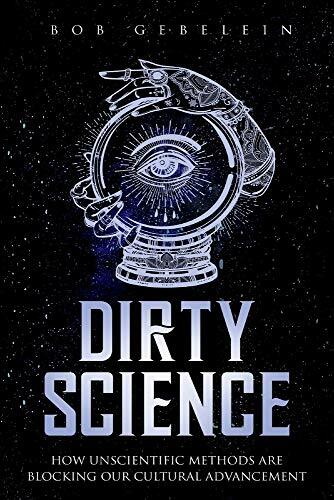 Academic Prejudices and Abuse of Power Inspire Author Bob Gebelein's latest release "Dirty Science"
"Dirty Science" exposes corruption within the scientific establishment and advocates for change of the status quo. DURHAM, N.C. - April 15, 2019 - PRLog -- In Dirty Science, author Bob Gebelein discusses corruption in the scientific establishment regarding the acceptance of scientific research outside of the realm of physical science, imposing upon society that there is no reality beyond the physical. "Establishment scientists" have not proved this scientifically, but rather have resorted to unscientific methods to force their beliefs upon the academic community. Such tactics include ridicule and intimidation; anyone reaching beyond this scope is ostracized and shunned to the point of being denied publication, funding for research and even employment. This limited viewpoint blocks our entire culture from the benefits of scientific exploration in the mental and spiritual realms. Dirty Science was written to educate readers about this issue so that they can recognize when unscientific methods are being used to discredit someone. Early feedback from readers indicate overwhelming interest in the significance of this matter. Reviewer Nancy Eaton states, "The author will bring up many subjects that he is very passionate about and you will be left with many things to think about…you will find this book unique and compelling." As to the importance of research outside the realm of physical science, Paige Lovitt of Reader Views says, "It is important to note that the author discussed valid research that has been done in the area of parapsychology. I personally have had many experiences that I have been unable to explain. I want to be able to refer to valid research to get an idea of what I might have been experiencing. As long as credible researchers are discouraged from sharing research outside of physicalism, our resources will be limited." Bob Gebelein graduated from Harvard with a BA in Mathematics in 1956, and then went on to have a legendary career as a computer programmer and creator of software systems. The main focus of his adult life has been to create a new civilization, because of the threat of nuclear annihilation and other cultural problems. His methods were psychotherapy, withdrawal from the culture, and dream analysis. He succeeded in his quest by discovering how "human nature" itself can be changed, to compassion and altruism, to create a new kind of human being, who will then create a new civilization. Bob Gebelein is also the author of Re-Educating Myself and The Mental Environment. "Dirty Science" (ISBN 9780961461140, BookBaby, 2019) is available at local and online bookstores. For more information, visit http://www.dirtyscience.net. Publicity contact: http://www.readerviews.com. Review copies available upon request.